C3D-FLI: Front Signal Light Inserts are a great way to add modern styling and class to your bike while also increasing visibility. The factory has engineered the lens to amplify light output for maximum brightness as well as DOT compliance. 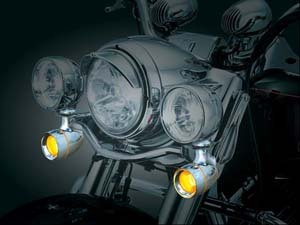 The result is an eye-catching white LED halo driving light and super bright amber turn signal. Important note for our international customers: Harley-Davidsons sold outside the United States sometimes have single circuit sockets. These Turn Signal Inserts require a dual circuit socket to function. 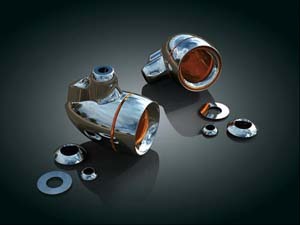 Please contact us before your order if you need assistance determining which socket you have. 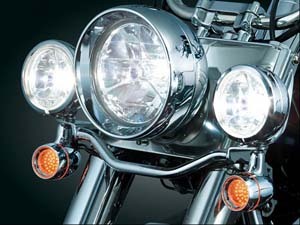 Fits 2000 and later H-D models with bullet turn signals. 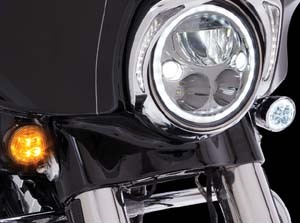 BL-11: It's incredible how much the simple front turn signal swap will streamline the front of your FLHT or Heritage! By simply replacing the stock flat turn signals with these sleek bullet models, the front end will appear lighter & more proportionate. Mounting is the same as stock for ultra clean installation. Fits: ’94 to current FLHT, FLHTC, FLHTCU, FLHTK, FLHR, FLHRC, & ’96 tp current FLSTC. 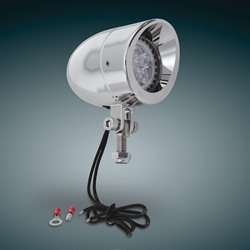 BB-104A: This die-cast bullet driving light features a 50 watt, 12 volt halogen bulb. Has its own visor built in the bezel. Set screw bezeling allows for complete rotation of the visor. Light is 3- 3/4" long with a diameter of 2-3/8". 50 Watt - Die Cast 8mm Stem. BB-104LED: This high-output, high-intensity Litespan LED is an easily installed replacement for your halogen lights. LED’s operate at a lower temperature and power load than halogen with an average 25,000 hours of use. Thisminiature LED reflector bulb produces 400 Lumens from its 12 volt 7 watt 6 LED output with a bright white 4000k color output. These non-dimmable Litespan LED’s fit all standard MR16 Bi-Pin GU5.3 bases. Their concentrated beam angle of 20° puts morelight down the road in front of you for true driving light capability. Replaces Halogen bulbs as used in other Mini Driving Light kits. Also now available in Big Bike with built in visors. These die cast chrome universal LED lights are 3 ¾” long with a 2 3/8” diameter that can mount to existing light bars with their 8mm mount. LED MINI DRIVING LIGHT, With Visor 12 Volt 7 watt, 400 Lumens 4000K Bi-Pin GU5.3 Base, Non-Dimmable Hi Output LED. 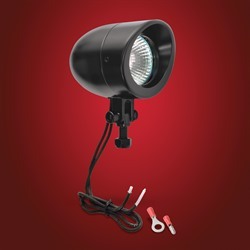 BB-B104A: 2 3/8’’ diameter die cast Mini Driving Light is now available in Black Satin Powder Coat in Halogen. Powered by a bright 50 watt MR16 Halogen bulb. 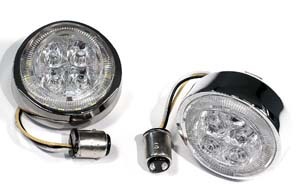 BLACK MINI DRIVING LIGHT, With Visor - Smooth Finish, 3 3/4" x 2 3/8" 50 Watt Halogen, Die Cast 8mm Stem. BB-B104LED: 2 3/8’’ diameter die cast Mini Driving Light is now available in Black Satin Powder Coat in LED version. 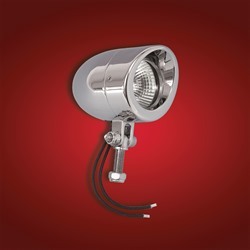 Powered by a high-output, high intensity Litespan LED reflector bulb producing 400 Lumens from its 12 volt 7 watt 6 LED 4000K bright white color. These non- dimmable Litespan LEDs provide a concentrated 20° beam putting more lightdown the road in front of you for a true Mini Driving Light capability. BLACK LED DRIVING LIGHT, With Visor 12 Volt 7 watt, 400 Lumens 4000K Bi-Pin, Non-Dimmable Hi Output LED.